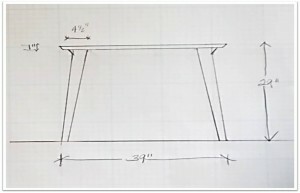 How do I Design a Custom Piece of Furniture? I have been asked how I go about designing custom pieces of furniture. There are many factors that guide my design process, most importantly, I consider how the piece of furniture will be used. My client’s lifestyle influences the materials I choose. I generally have a rough idea of a style in mind. I draw inspiration from many sources; my years as an Interior Designer, my travels around designer showrooms, design magazines and more recently from online sources. The architecture of the home can also be important. In the case of the custom table outlined below, the home is Mid-Century contemporary, so I wanted an updated style that had references to that time period. To begin the actual design of the piece, I needed to take dimensions and pictures of the space where it would be located. 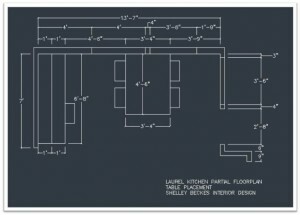 My Design Assistant, Pamela Jump, put the dimensions into the computer and drew the table “to scale” into the floor plan. Then we were able to determine the best size and make sure there is adequate room for the chairs to be moved in and out. The fun part starts when I do a series of freehand sketches then Pamela and I can play around and experiment with some unique ideas for the shape and style. 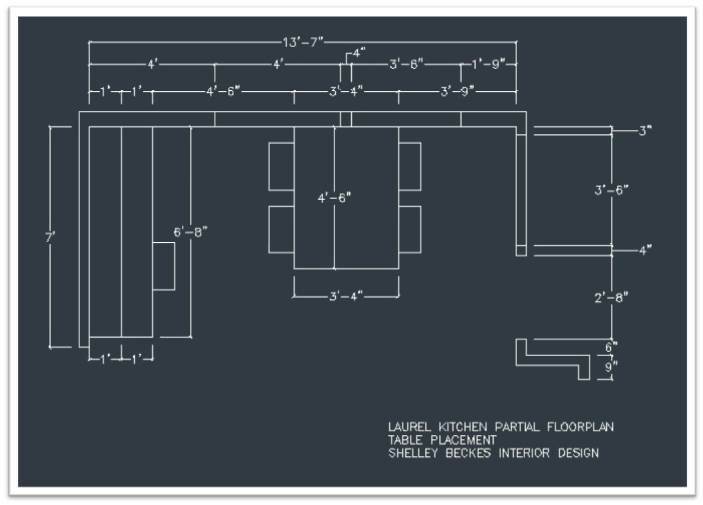 Once we decide on design lines and dimensions, I have Pamela draw it up in AutoCAD. 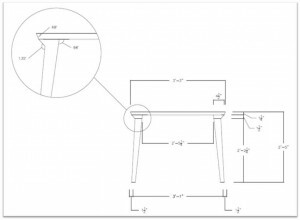 This drawing is the final sketch that shows the slightly angled legs and the angled sides of the tabletop, which was the design I wanted to move forward with. 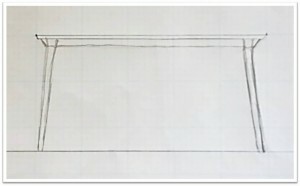 In this sketch, I decided on the dimensions of the table. These are the dimensions from a side view. 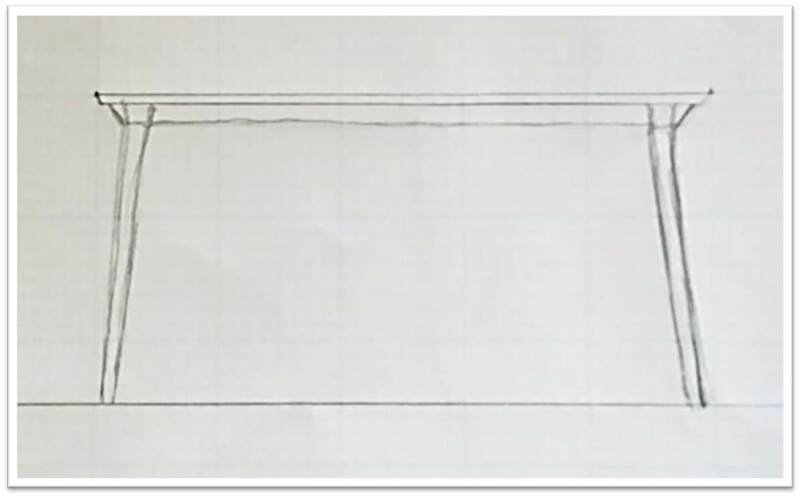 Our next step was to draw the table in CAD. 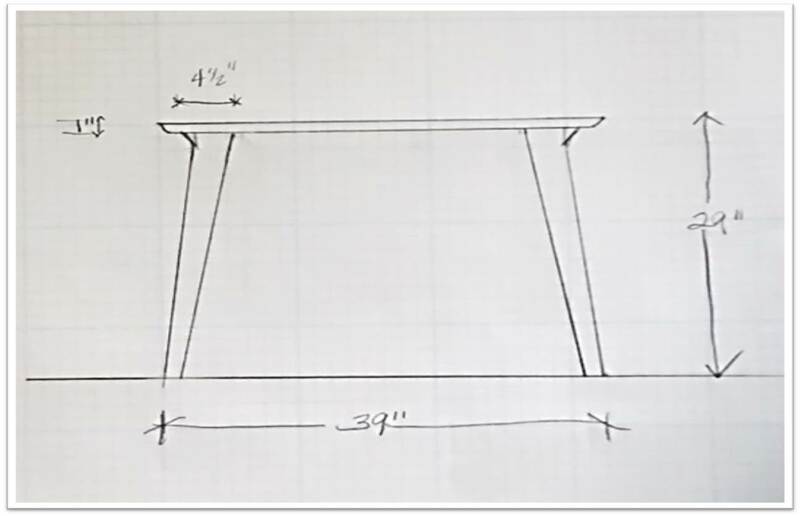 From the sketches, Pamela drew the table with its’ final specific measurements. 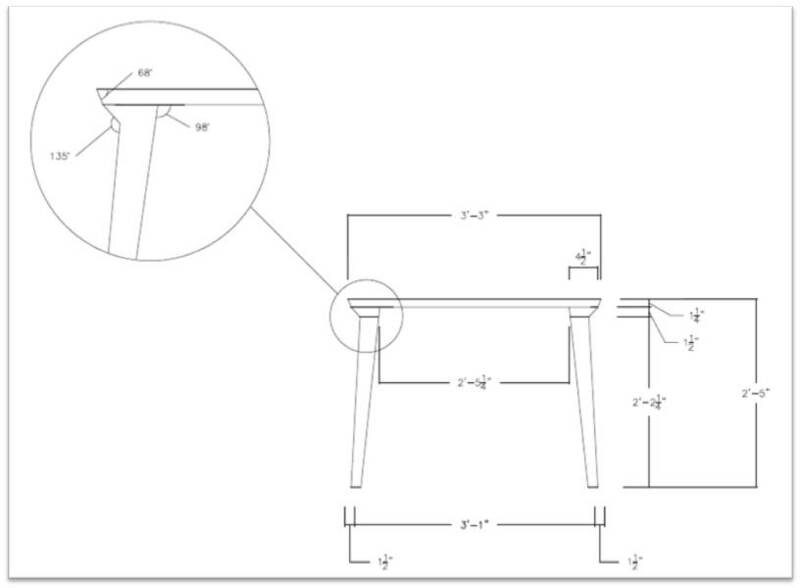 When the measurements are finalized, we submit the drawings to the furniture maker. 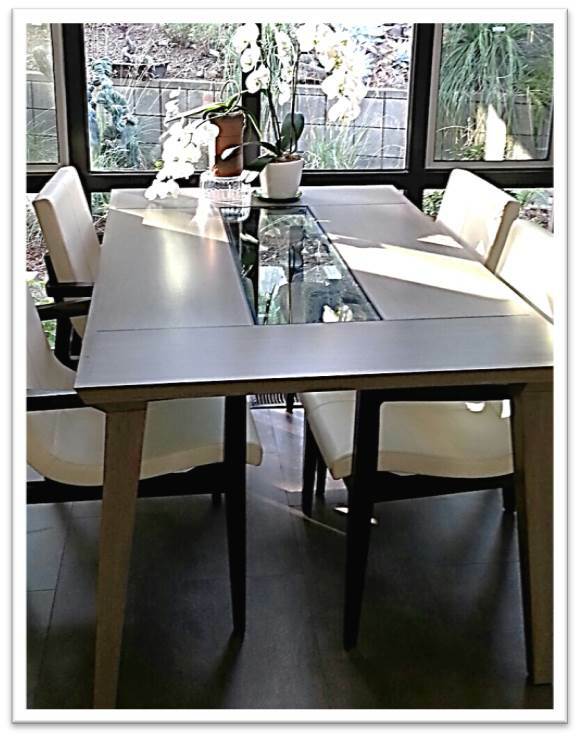 I designed this table for my client’s breakfast area in their active kitchen. I wanted the table to be stylish, simple and easy to move. It also needed to hold up to a lot of use. I selected oak because it is a very hard wood, but I used a more expensive cut called “rift sawn” oak. I like rift sawn oak because it has an even grain, unlike the standard cuts of oak. To take the yellow/orange tones out of the oak, I had the wood bleached prior to being finished. That allowed me to stain the wood in a medium taupe tone, which would have been hard to achieve without bleaching. To keep the style lighter, I added a small piece of glass inset in the center, but scaled the size of the glass to allow enough space for place mats to be used on the wood portion. To add a little extra detail I had the glass outlined with small strips of a dark stained wood called Wenge. 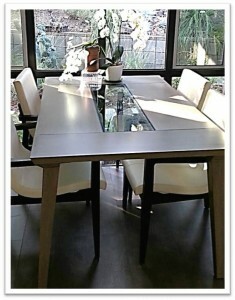 The added bonus was that the glass reflected my client’s beautiful garden on the top of the table. Voila’. We have the beautiful finished product. A very special part of my job is having the ability (and willing clients) to create custom, one-of-a-kind furniture pieces. When I get the opportunity to design a custom piece of furniture, my design process helps insure that a gorgeous, high quality piece of furniture will be the end result!